Biotinylated Human ITGA8 & ITGB1 Heterodimer Protein (IT1-H82Wb) is expressed from human 293 cells (HEK293). It contains AA Phe 39 - Leu 1012 (ITGA8) & Gln 21 - Asp 728 (ITGB1) (Accession # P53708-1 (ITGA8) & P05556-1 (ITGB1)). Biotinylated Human ITGA8 & ITGB1 Heterodimer Protein, produced by co-expression of ITGA8 and ITGB1, has a calculated MW of 116.4 kDa (ITGA8) & 83.7 kDa (ITGB1). Subunit ITGA8 is fused with an acidic tail at the C-terminus and followed by a polyhistidine tag and an Avi tag and subunit ITGB1 contains no tag but a basic tail at the C-terminus. The reducing (R) protein migrates as 110 kDa and 120 kDa due to glycosylation. Lyophilized from 0.22 μm filtered solution in 50 mM Tris, 150 mM NaCl, pH7.5. Normally trehalose is added as protectant before lyophilization. 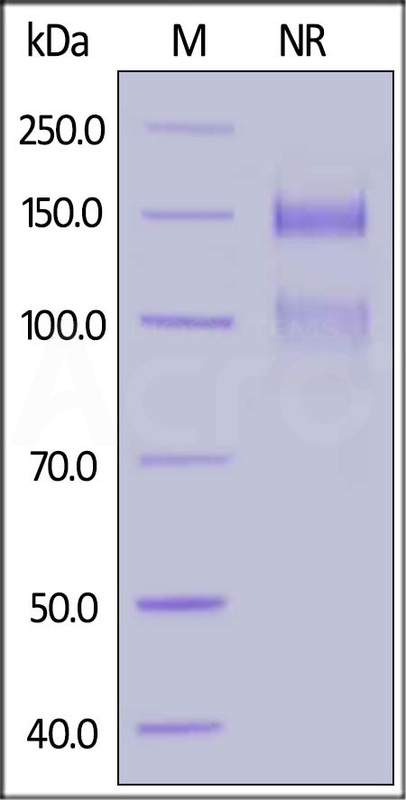 Biotinylated Human ITGA8 & ITGB1 Heterodimer Protein on SDS-PAGE under reducing (R) condition. The gel was stained overnight with Coomassie Blue. The purity of the protein is greater than 90%. 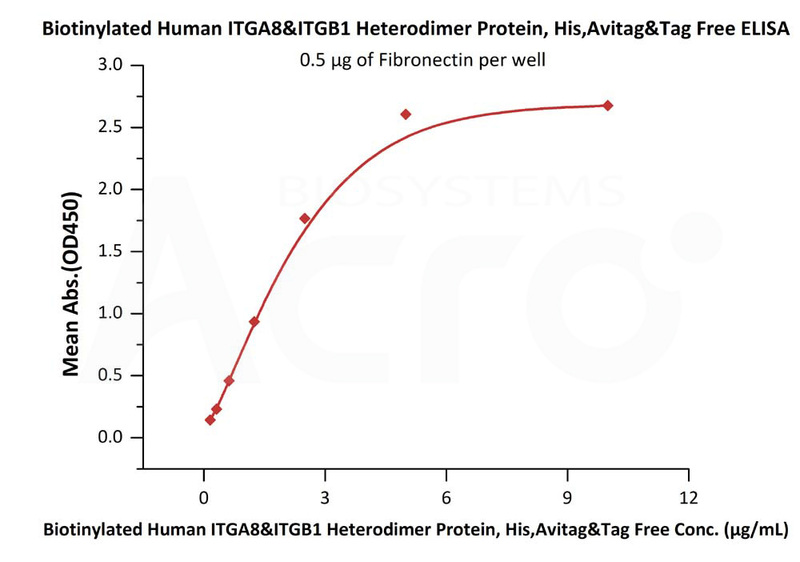 Immobilized Fibronectin at 5 μg/mL (100 μL/well) can bind Biotinylated Human ITGA8 & ITGB1 Heterodimer Protein (Cat. No. IT1-H82Wb) with a linear range of 0.156-5 μg/mL (QC tested). Human Integrin alpha 8 beta 1 Heterodimer Protein consists of ITGA8 and ITGB1. The integrin alpha 8 subunit, isolated by low stringency hybridization, is a novel integrin subunit that associates with beta 1. The recently identified alpha 8 integrin subunit associates with beta 1 and is predominantly expressed in smooth muscle and other contractile cells in adult tissues, and in mesenchymal and neural cells during development. In addition, Integrin alpha 8 beta 1 is a receptor for fibronectin and can promote attachment, cell spreading, and neurite outgrowth on fibronectin. (1) Müller U, et al., 1995, Mol Biol Cell 6(4):433-48. (2) Schnapp LM, et al., 1995, J Biol Chem 270(39):23196-202. (3) Marek I, et al., 2014, Cell Adh Migr 8(4): 389–395.